Second Form is a Form in Kingdom Hearts III. It grants Sora clothing based on his outfit from Kingdom Hearts II and gives him access to familiar abilities. It is triggered by the Kingdom Key, Starlight, Midnight Blue, Phantom Green, and Dawn Till Dusk. Although each of these Keyblades has a nominally different Formchange determined by the Keyblade—"Second Form", "Second Form S", "Second Form M", "Second Form P", and "Second Form D", respectively—only Second Form S actually differs from the others. Second Form changes Sora's clothes into the same colors and style of the clothes he wore in Kingdom Hearts II. While wearing his original outfit during the Olympus episode, Sora's clothes do not change. In addition, when using the max-level Shotlock, Sora's clothes will also briefly change to his Kingdom Hearts II style, even when not in Second Form. 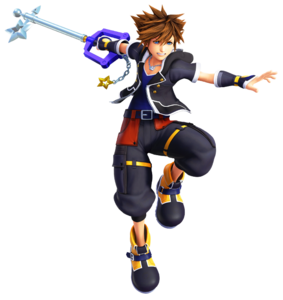 Second Form grants Sora several of his abilities from Kingdom Hearts and Kingdom Hearts II that are otherwise unusable outside of the Formchange. At any time, Sora can use a situation command finisher that will also terminate the formchange. Each time he fills the Situation Gauge, this finisher is replaced with a more powerful finisher—first Stun Impact, then Sonic Blade, and finally Ars Arcanum. Second Form S replaces Ars Arcanum with Ancient Light. High Jump Leap high into the air. The longer you hold , the higher the jump. Combo Master Continues combos even if your swings miss the enemy. Lucky Strike Increase how often enemies drop items. Stack the ability to increase the effect. Master Treasure Magnet Automatically draw in and collect nearby prizes, no matter how far away they are. MP Haste Recharge MP 10% faster when you run out. Stack the ability to increase the effect. Explosion Punish enemies with a ring of powerful, revolving orbs. Your Magic stat determines damage. Lunge 'n' Launch Lunge at foes with a devastating strike and launch them skyward. Ripple Drive Generate a magical aura that engulfs surrounding enemies. Your Magic stat determines damage. Hurricane Winder Somersault at enemies and hit them with a devastating series of blows. Aerial Finish Issue a devastating flurry of attacks that sends enemies reeling. Magnet Burst Draw foes in, then expel them with a devastating blast. Your Magic stat determines damage. Stun Impact Project a shock wave that stuns enemies. Your Magic stat determines damage. Sonic Blade Strike at the enemies as you race by. Continue pressing when prompted to perform additional attacks. Ars Arcanum Ravage the enemy with a devastating flurry of attacks. Continue pressing when prompted to perform additional attacks. Ancient Light Annihilate surrounding foes with five columns of crisscrossing light. Your Magic stat determines damage.